Borg has cleverly entangled a natural Tahoe-born killer into an intense murder mystery set in our backyard. 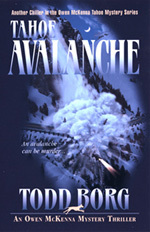 What appears to be an unfortunate accident caused by an avalanche at Emerald Bay, quickly explodes into a complex plot of twists and turns that leads to murder and intrigue. 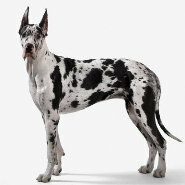 Tahoe Detective Owen McKenna and Spot, his Great Dane, become engulfed in deciphering what is triggering several avalanches around the basin….before it’s too late. Similar to his other mysteries and attention to detail, Todd did his research. He went to great lengths to learn about avalanche behavior and avalanche dog rescue procedures to provide accurate accounts to back up his story. Like his five other Tahoe-mysteries, Tahoe Avalanche jumps right into the plot building the suspense early and deliberately. It’s another classic page turner that takes a natural Tahoe phenomenon and makes it the central theme and prime character. A group of young people learn of an event that took place during the heyday of the Comstock Lode, 140 years ago. Now those people are dying in avalanches. Detective Owen McKenna has to uncover the secret that connects the victims to a San Francisco mobster and a ruthless killer. McKenna goes from city to vineyard to the shoulder of Tahoe’s highest mountain where one more avalanche is coming to kill the last victim and bury the secret forever. Borg is author of five other award-winning Tahoe-set mysteries: Tahoe Deathfall, Tahoe Blowup, Tahoe Ice Grave, Tahoe Killshot and Tahoe Silence which just won the 2007 Ben Franklin Award for Best Mystery of the Year. Learn more about Todd and his Owen McKenna Mystery Thrillers at his website – www.toddborg.com. 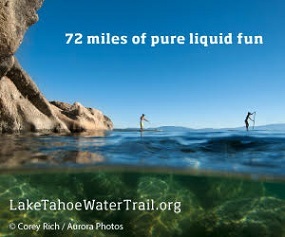 It’s the perfect gift for those who know and love Tahoe, and suspense! You can reach Todd via email at todd@toddborg.com. Hope Valley Outdoors YurtDo you know…how KT-22 got its name?